Intimate yet glamorous and sleek, Liberty Private Works is a private kitchen which first opened in June 2009 on Wellington Street and then relocated to its current location on Stanley Street in September 2011. High ceilings and bar tables make for a contemporary setting, and the use of red in its colour scheme reminded me of the interior of L’Atelier de Joel Robuchon. 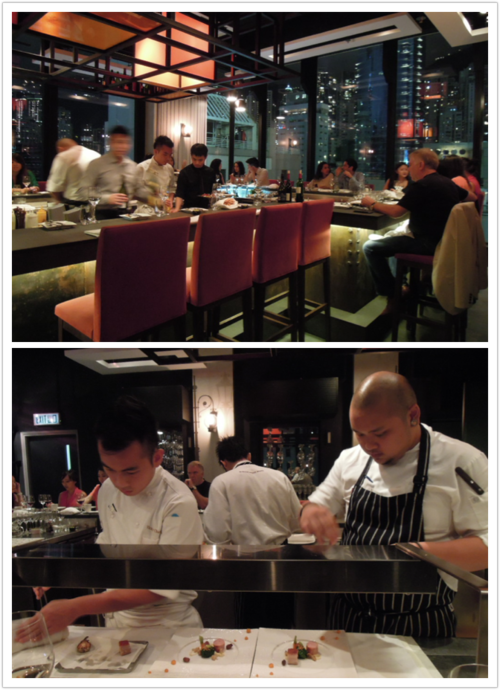 Watching award-winning chef, Vicky Cheng, and his team bustling about and preparing our dishes right in front of us in the open kitchen kept all of us captivated the entire meal. Vicky Cheng is the Executive Chef of Liberty Private Works and Liberty Exchange Kitchen & Bar in Exchange Square. Vicky comes from Toronto, and has worked in the Michelin three-starred Daniel in New York, alongside Daniel Boulud, until a mysterious twist of fate brought him to Hong Kong (i.e. he had to come back to renew his Hong Kong ID card). Vicky explained to us that while Liberty Private Works serves gourmet, refined food, Liberty Exchange’s cuisine is much more rustic and bistro-styled in comparison. A 10-course degustation menu is available each night for $800 per person, and one item on the menu is changed every week, except for the two signature dishes (courses (2) and (5) below) that will always stay on the menu. Vicky was friendly and professional, and graciously introduced each course to us, and the rest of his team was equally convivial and assured. Booking is allowed one month in advance. Since this private kitchen only seats around 20 persons, you should book exactly one month before the day you want to come to avoid disappointments! (1) We started off with this artistic amuse-bouche, comprising of fresh tomato, mozzarella cheese powder, jelly made from tomato consommé, olive oil caviar and yellow tomato coolie. 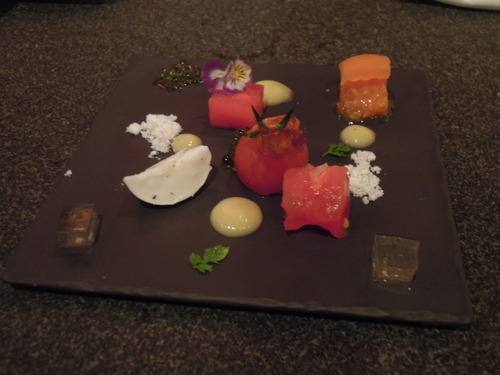 The presentation was breathtaking, and the dish provided a variety of textures and complex flavours. I absolutely adored how an insalata caprese (i.e. tomato, mozzarella and olive oil) has been turned into a platter so stunning and exciting. What I loved the most was the olive oil caviar which had a lingering olive taste, and really lit up the whole platter. 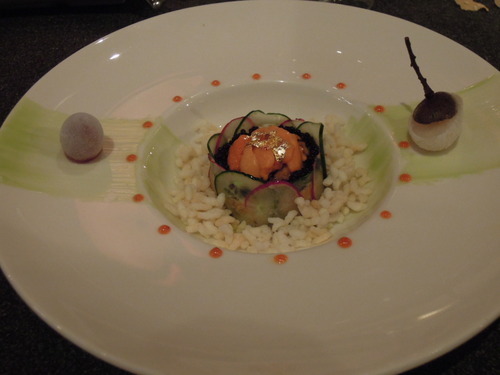 (2) ♥♥♥ The amuse-bouche was followed by this Tuna, Sea Urchin, Espelette, Rice, which was one of Liberty Private Works’ two signature dishes. There are two pieces of frozen fruits on the side of the plate. We were told to start with eating the frozen grape on left, in order to lower the temperature of our palette for eating the sea urchin. Freezing fruits in this way was such an ingenious idea! It felt like eating sorbet, except the grape was even sweeter and more delicious! The sea urchin was exquisite, and its touch of spiciness added some excitement to this luxurious dish. Moreover, the combination of creamy sea urchin and crispy rice was sublime! I also adored the tuna tartare, as well as the story behind it – Vicky told us that when he worked at Daniel in New York, he would always use leftover tuna to make tuna tartare for Daniel Boulud and the other staff at the restaurant. They all loved his tuna tartare and he promised himself that if he were to open a restaurant, he would definitely create a dish which includes tuna tartare in it. Lastly, we ate the frozen longan on the left as a palate cleanser before our next course. (3) Our third course was the Scallop, Iberico Ham, Dashi, Egg White. On the left was a piece of Iberico Ham Jelly which beautifully melted in my mouth. The Pan-Fried Seared Scallops were perfectly fried and juicy, and tasted incredible with the accompanying herbs on the plate. The Scallop Tartare with Lemon Purée had a remarkably refreshing lemon taste, and was velvety and tender. Lastly, the oriental-inspired Daikon with Steamed Egg White and Dried Scallops had a soothingly mild taste, and the dried scallops were gorgeously crunchy. 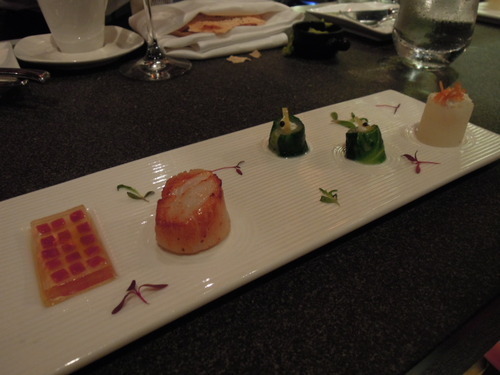 My only complaint, however, was that the Iberico Ham Jelly verged on salty, while the Daikon had a rather feeble taste. 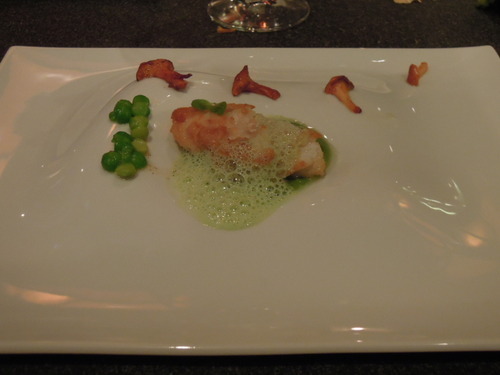 (4) Next on the menu was the Market Fish, Chanterelle, Peas, Vanilla. The portion may look small to some people, but in fact it was just right given that we were having a 10-course degustation menu. The fish had a nicely firm texture, and the indulgent, buttery pea purée was also commendable. 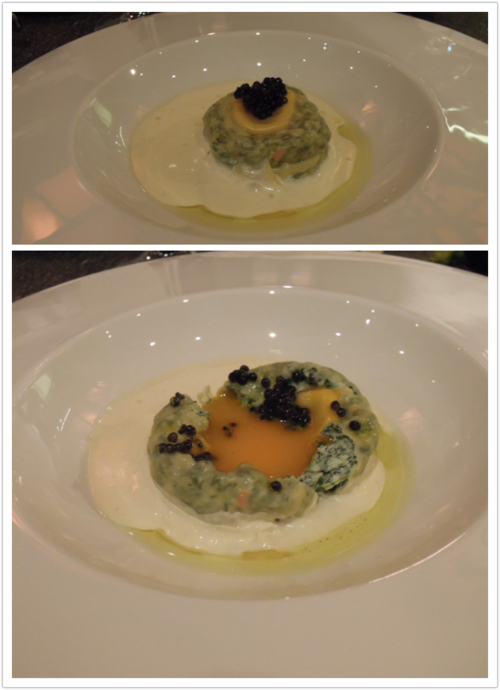 (5) ♥♥♥ This Egg, Truffle, Parmesan, Caviar is their other signature dish. A strong and alluring aroma of truffle filled the restaurant as this course was prepared. This Raviolo was served with Parmasan foam at the bottom, had a spinach and ricotta cheese filling, and also had an egg yolk wrapped in it. It was topped with some caviar and was served with a small piece of baguette. Vicky recommended that we break the egg yolk when eating it. I cannot praise this dish enough – it was incredibly thoughtful and indulgent, with marvellously rich flavours coming from the Parmesan cheese, ricotta and egg yolk, which were balanced by the lightness of the thin raviolo wrapper. The caviar added a contrasting texture to the soft raviolo, and it was such a delight for all of us to dip the baguette in the remaining Parmasan foam. (6) I loved how the plate was still very hot when this Duck, Pancetta, Morel, Edamame was brought to us.The Seared Duck Breast had a remarkable texture, but taste-wise it was not outstanding. The soft, delicate Seared White Asparagus, the creamy edamame purée and the Crispy Spring Roll with Foie Gras and Duck Confit were all enjoyable. The jus made from duck bone reduction and fig, which was a touch sweet, and the white asparagus foam made for some delicious seasoning for this dish. 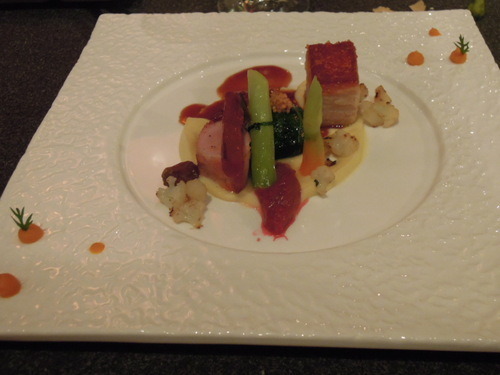 (7) This beautiful Pork, Cauliflower, Rhubarb, Macadamia Nut was a dual pork dish, comprised of a piece of delectable Seared Pork Loin with a subtle peppery taste, and a piece of Roast Pork which had a excellently crispy skin. However, the one thing missing about this dish was that the Roast Pork’s texture was not tender enough. It had actually been slow cooked for 36 hours, so I would have expected a softer and more velvety texture. 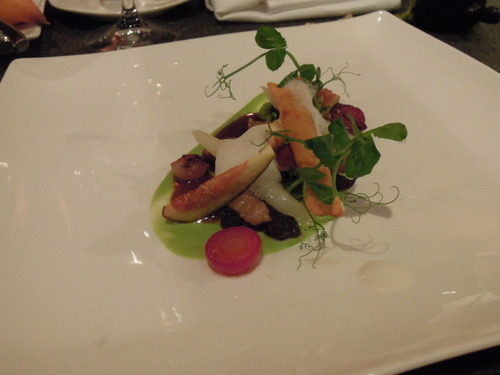 (See The Ledbury (London) for the best slow cooked pork ever, and Hibiscus (London) which also did a great job.) That aside, the sweet sauce made with macadamia nut and pork jus was fantastic. (8) I had been looking forward to the desserts the entire meal, and this Pineapple, Coconut, Olive Oil, Black Pepper did not disappoint. 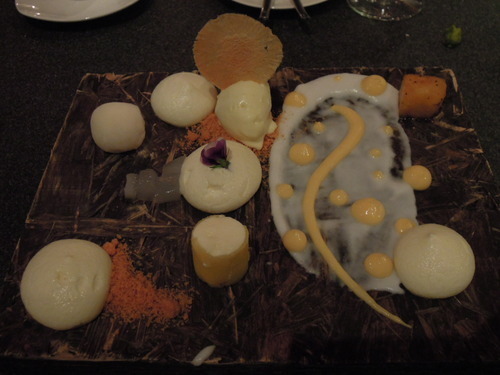 The awesome presentation, which resembled a cheese platter, immediately whetted my appetite. There was a scoop of olive oil ice cream, which had an amazing “oily” yet refreshing taste (and by “oily” I mean “tastes like oil”, not greasy!) There were a few absolutely delicate and scrumptious Condensed Milk Mochis, and some Pina Colada Foam which was supposed to be eaten with the edible flowers. 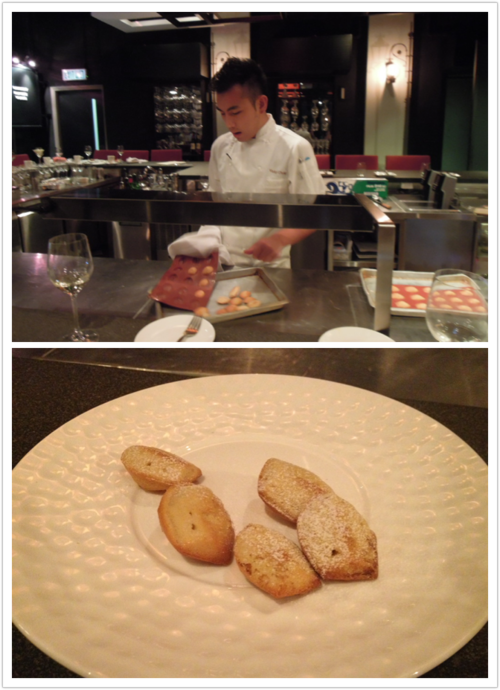 There was also some Coconut Mousse wrapped with thinly sliced Roasted Pineapple, which was sweet, creamy and fabulous. I seem to be head over heels with any combination of pineapple and coconut lately – see Ocean (Hong Kong) for another pineapple and coconut dessert which makes me drool just thinking about it! 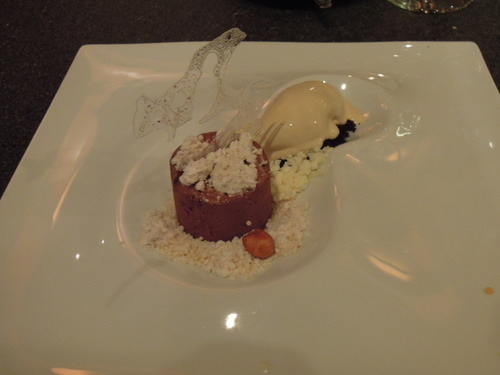 (9) One dessert was definitely not enough, so fortunately there was also a Hazelnut, Chili, Earl Grey, White Chocolate on the menu. The Earl Grey Ice Cream with dark chocolate powder had a stunningly creamy texture (see Koffman’s (London) for other exquisite homemade ice creams), and the sophisticated taste of Earl Grey really awakened me at night. The Japanese rice pearls were crunchy little balls which were not sweet and therefore balanced out the sweetness of Hazelnut Mousse. The use of the Japanese rice pearls bore a resemblance to the Crispy Rice used to accompany the Sea Urchin in the second course of the meal. Lastly, I should mention that there were actually a few Chilli Seeds on the side of the plate for spicing up our palate for this dessert, but I was not feeling adventurous enough to try them. (10) ♥♥♥ Lastly, Vicky freshly baked some homemade Madeleines right before us; he said that the madeleines were like a soufflé in the sense that they had to be eaten between the 1st and 4th minute after they were out from the oven. Needless to say, I was absolutely stuffed with food and wine after the previous 9 courses, but when these lovely, heavenly Madeleines appeared before my eyes, I just couldn’t stop eating! They were so unbelievably light and fluffy that I instantly fell in love with them. Did Vicky deliberately save the best thing till the end? Conclusion: While every course on the degustation menu was accomplished, what I have absolutely fallen in love with were the (2) Sea Urchin and Tuna Tartare, (5) Egg Yolk Raviolo and (10) Homemade Madeleines. The passion, dedication and innovation of Vicky and his team shone through the cuisine, and this is definitely a private kitchen that I can see myself coming back to.